Watching Wong Kar Wai's In the Mood for Love (or Huyàng Niánhuá, or The Time Of Blossoms), was an interesting experience: the 99 minute long film is clearly a superior work of art and cinema, but just as clearly not a great film, and this is apart from its rather muddled and poor ending. Let me get the ending out of the way first, since that is the film’s biggest sticking point. No, it’s not as bad, relatively, an ending as, say, Akira Kurosawa’s Rashomon. The bulk of the film is set in 1962, in Hong Kong, as two cuckolded spouses find out their beloveds are having an affair with one another. What makes this work is that we never get even a glimpse of the adulterers. The film stays focused on the cuckolds, Mr. Chow (Tony Leung) and Mrs. Chan (Maggie Cheung), who develop their own affaire de coeur, which gets neighbors’ tongues wagging. Then there are a few scenes set in the immediate years after, before the film ends at Angkor Wat, the temple ruins in Cambodia, wherein Chow, having not realized his missed opportunities with Chan, is seen briefly doing something odd, by kissing or blowing into a temple ruin, before the film’s end. There are two problems with this scene: the first is that the immensity and overwhelm of the natural and ruined beauty of the jungle and temple simply overwhelms the viewers’ senses, for, before that, all we get are urban scenes, and interior set pieces. The shock of the visual change so engages that the scene that shows Chow seems an afterthought, and the viewer simply regards the character as an afterthought. It’s akin to the complexity and overwhelm of viewing a Hudson River School painting, which focuses on a great natural beauty, and marginalizes the human characters often painted in the corners. Then there is the odd thing that Chow seems to be doing before the film’s fade to black. It goes by so quickly, and Chow, in the scene, is so small, especially in relation to the beauty overwhelm, that one is left not knowing what to make of it. Lacking instant replay capacities, as I watched the film on Netflix, I gazed at some other reviews, to see what other viewers and critics thought of the ending, and then it became clear, as the ending was a direct referral to a comment made, earlier in the film, that some tribal cultures believed that by whispering a wish into a hole dug in a tree, then covering up the hole, the wish would come true. This would have been an excellent ending had a) we not gotten a few false endings beforehand, and Chow not been so marginalized in the Cambodian scene. But, even before the muddled end, the film just misses out on greatness by never opening the film up. We never get a sense of the interior lives of the characters, as we do in Alain Resnais’s Hiroshima, Mon Amour, another film that misses out on greatness, for other reasons than this film does. Stylistically, however, the film is a marvel at setting us up into the lives of these people, and at putting us swiftly into their bygone reality. Swift scenes that capture a point in ten or twelve seconds show how fast cuts can work, as opposed to modern Hollywood’s vapid use of the technique. We see how the lives of Chow and Chan intersect, at home, where they rent rooms in adjoining apartments, and at work. We subtly and brilliantly find out how both discover their spouses’ infidelity, as well as that being with each others’ spouses. Through their own growing attraction to each other, they learn how one can be emotionally unfaithful, but they never act on their feelings, and, instead, rehearse how they will confront their ever absent spouses- hers on business trips, and his on family issues. Sometimes, scenes are replayed from differing perspectives, or with differing results. These can be seen as fantasies, or retakes in the minds of the characters, or they may be real. In the end, it does not matter, for their end is where the film is directed. So, too, the viewer, which makes the end such a profound letdown, for, while the film is not complex, it could be profound. Instead, it becomes just an affair of the heart- one of many like it, and not something truly illustrative of the human animal’s wonts and weaknesses. Technically, the film is brilliant, and the screenplay, written by the director, has many excellent moments. Michael Galasso’s and Shigeru Umebayashi’s non-Oriental music choices, for the soundtrack, are amongst the most perfect and evocative of any film I’ve seen. The songs, themselves, are not so great, as much as their mix into the visuals, for contrast and highlight, makes the music utterly indispensable to this film. That is VERY rare, indeed. Simply put, any other soundtrack would leave this film as a mere good, solid work of art. 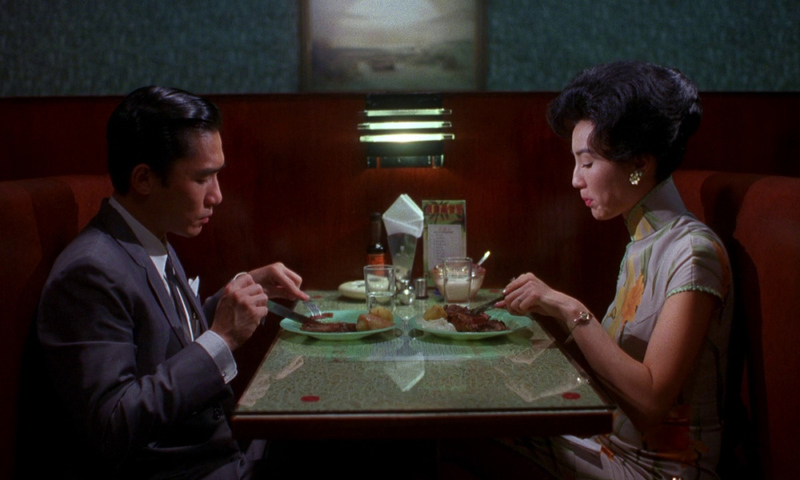 The old line, almost noir, cinematography of Christopher Doyle and Pin Bing Lee, is also essential to this film’s overall success, as is William Chang’s editing, especially in the quick cut scenes that set up the film early on. But, the film is also dependent upon its lead actors- Leung and Cheung. Their love of silly martial arts pulp serials seems utterly believable. Never having been to the Orient, it is realistic to believe that a culture would obsess on that the way America did on films noir, comic books, or baseball cards. Hence, even if merely an invention, it works. Its reality, and even truth, is not as important as its ability to imbue a sense of realism into the film. And this shared love forms the core of their relationship, aside from their being mutually cuckolded. Chow eventually cannot take the stasis, so leaves for Singapore, and asks Chan to come with him. She refuses, but relents. It is too late, as he has left. Over a few years they almost cross paths, several times, but one or the other relents, or just misses the other. Then we are overwhelmed and put off by the ending. Some critics contended that the pair was no different than the adulterous partners- that they simply didn’t act on their emotional affair, or that all the duo shared was a mutual lust. This is nonsense. Simply watching the actors, one gets a sense of connection far beyond the sexual. Are they deep or profound individuals? Clearly not, but that does not mean their connection cannot be profound. They simply do not want to ‘sleep with each other,’ they clearly long for more, unlike their predictable and boring spouses. Chan and Chow’s love is deep, profound, and, ultimately, untenable, because of its profundity. This is why the ending is so poor. We’ve already seen the frustration of their love; it need not be made central to the end, as it is to the film. Instead of Chow’s pathetic tree whispering (hey, if one can horse whisper, why not tree whisper? ), the film should have ended with both of them having moved on, with their brief love a fading beautiful thing. The film’s title cards suggest this very end, but show the bad ending, trying to have its cake, while having consumed it. Bad choice.